A new book shows it is time to realize a movie script conceived by Salvador Dalí and the Marx brothers in 1937. Bombastic movie projects that never see the light are wrapped in a mythical aura: a reinterpretation of Superman by Tim Burton, a sci-fi epic by Stanley Kubrick, and David Lynch’s Ronny Rocket come to mind. 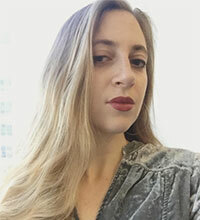 Pop-culture scholar Josh Frank, known for his books on Peter Ivers and the Pixies, has tried to give shape to the most surreal flight of fancy there ever was: a would-be/could-be collaboration in 1937 between Salvador Dalí and the Marx brothers, titled Giraffes on Horseback Salad, or The Surrealist Woman. A sense of marvel persists throughout the book. 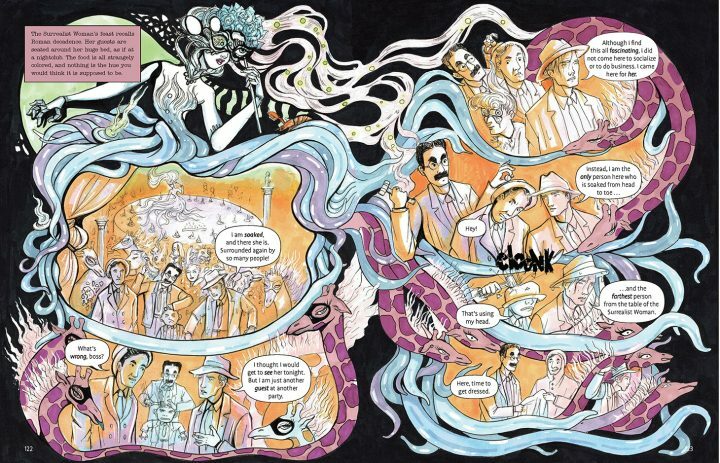 Introducing the graphic novel is a childrens’-book-like narrative — meaning, slender blocks of texts with elaborate illustrations adorning either the margins or the lower half of a page — detailing how Dali came to America and became friendly with Harpo Marx. This affinity with books for kids is limited to format. The sepia-toned illustrations are decidedly adult, with depictions of Harpo Marx reclining, roman-god-style, fondling a swan and wearing a crown of roses, and the texts are rife with surreal anecdotes. One stands out: Dalí kicking a cart carrying a legless man across the street, and coming to the conclusion that Paris society was done for and that it was time for him to move to America. The graphic-novel section is the visual representation of fragments, summaries, and annotations that constitute Dalí’s script for Giraffes on Horseback Salad. The only cogent element of the so-called plot involves a Spanish transplant in New York named “Jimmy” (played by Harpo Marx) who is torn between his typical, shallow, 1930s-siren fiancée Linda and the so-called Surreal Woman, a mysterious figure that has a sublime, almost frightening beauty about her, whose face the audience never sees in full. The pages illustrated by Spanish artist Manuela Pertega are, for lack of a better term, frame-worthy. She ditches the grid format that characterizes straight-up narrative sequences in favor of pages designed to express the Surreal Woman’s conjuring up of surrealists fantasies. Neatly positioned arabesques and serpentine motifs translate the flight of fancy the characters experience when interacting with the Surreal Woman, those pages look like a maximalist hybrid of Dalí’s style, art nouveau, and the anime-like ethereal artworks of artist Yoshitaka Amano. Said visuals, which alternate between black-and-white for everyday-life segments, and saturated colors depicting anything involving the Surreal Woman, almost have the capacity to negate the need for text blocks altogether. 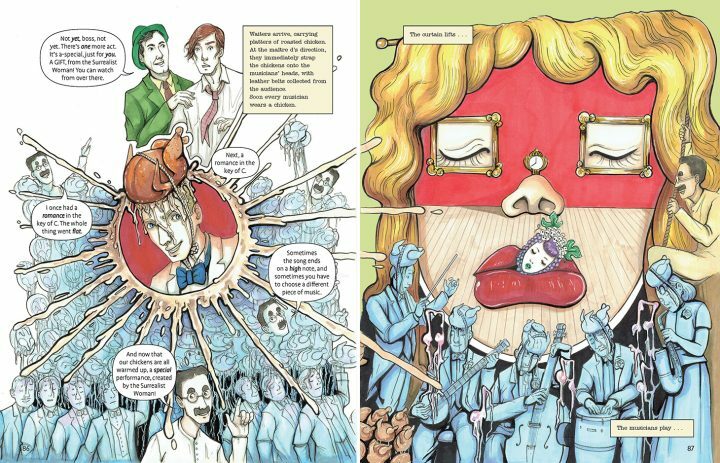 Even though the writers Frank and Heidecker are witty and irreverent while making sense of both Dalí’s worldview and the Marx brothers’ dynamic, their text interrupts, almost disturbs the sheer beauty of Manuela Pertega’s work. What’s written on the page, in all its screwball and vaudevillian glory, can be quite overwhelming to the reader, making the choice, as their eyes focus on text or image or design, tricky and exciting. Reading graphic novels allows for a fluid back and forth in looking at text and image. In this case, the text approximates a default mechanism to be leaned on when trying to make sense of the surreal illustrations. This is not a disparagement of the value of the book, but a reflection on the limits of a still image for a project of this scope. We can and might hope that, soon enough, an animation studio will pick it up and bring both the script and the visuals to life. 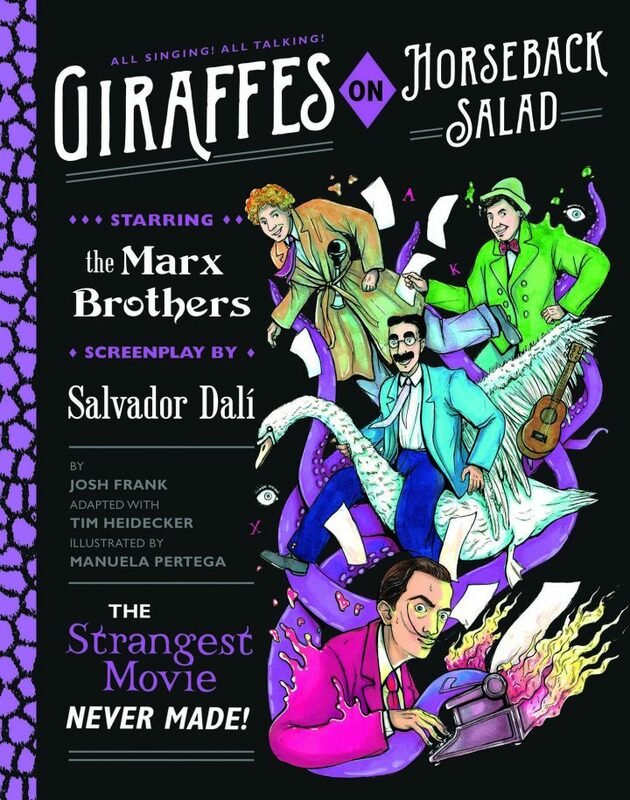 Giraffes on Horseback Salad: Salvador Dali, the Marx Brothers, and the Strangest Movie Never Made by Josh Frank, Tim Heidecker, and Manuela Pertega is published by Quirk Books; First Edition (March 19, 2019) and is available from Amazon and other online retailers.